One of my favourite children’s book and my mum’s favourite ever television adaption, I was delighted to be in the audience for the opening night of Goodnight Mister Tom, by Hallam ‘89 Theatre Club, who impressed me when I first saw them perform earlier this year. The play by David Wood, based on the classic novel by Michelle Magorian, introduces the audience to young William Beech, who is evacuated to the countryside at the outbreak of the Second World War and ends up at the home of elderly recluse Tom Oakley. Beautifully performed and directed, the company presented a moving, heartfelt and heart-warming production that was darker than other adaptions of the book but all the better for it, not being afraid to display the dark realities of war and evacuation. It should not be missed by fans of the book or those who have forgotten or want to discover why it has become a classic. At it’s heart a story of love, the central performances by Chris Boydell as Tom Oakley and Edward Warren as William Beech were superb, with Chris’s performance wonderfully combining immense grief for his late wife leading him to be misunderstood by those closest to him with growing love and compassion for William. An outstanding performance by anyone let alone someone so young, Edward beautifully captured the malnourishment, vulnerability, fear and eagerness to please of a child who had experienced far more than anyone should and the effects of the power of love and generosity on a child from those around him, especially of course Mister Tom. In contrast to the character of Tom, Suzanne Collett’s performance as Mrs Beech unnervingly captured what at the time would have been undiagnosed mental health issues and child abuse, which acting opposite her enabled Edward to showcase even more of his moving and emotional acting range. Other cast members who deserve a specific mention include Tana Holmes whose puppeteer skills perfectly brought to life Sammy, created by Sarah Lewis for the production, capturing the affections and joys of being a dog truly loved by his owner; Steve Holmes who captured the authority and respect of Doctor Little; David Hague’s almost Dad’s Army like portrayal of the ARP Warden; and Keane Ward’s marvellous portrayal of Zach, who as well as his growing friendship with Will shining through, displayed an enthusiasm for life added lightness to the performance. Whilst the ensemble of adults beautifully captured the feeling of the era both in the village and the city, it was the genuine friendship and bond between and natural talent of the children in the cast that shone through, making them one of the strongest child ensembles I have seen in Sheffield. In addition to mentioning the superb choice of music throughout the production, that not only captured the spirit and mood of the era but helped moved the story forward, I must give a special mention to Jonathan Payne for lighting, Tim Scowcroft for Sound and everyone in the costumes department for capturing the great contrast between the grey, dark, smoky noisiness of the city and the light, openness of the country and Will’s harrowing nightmare sequence, which is at risk of giving audience members nightmares, especially if they have a fear of needles. However, what will stay with me for a long time from this production is the moving use of unaccompanied singing of “Wish Me Lucky As You Wave Me Goodbye” and the most powerful use of single words since the Railway Children. 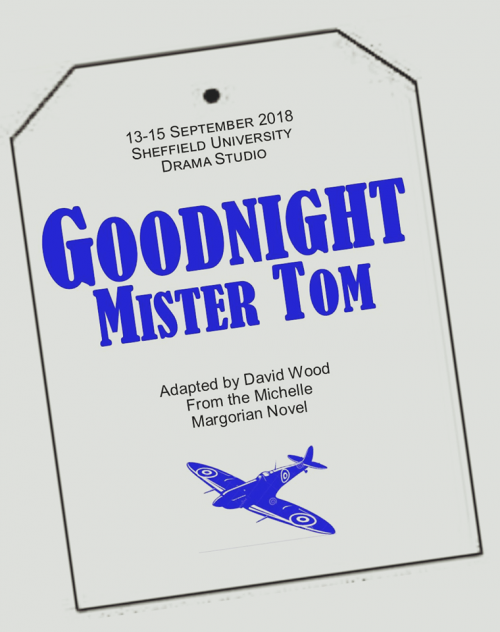 Goodnight Mister Tom will be performed at Sheffield University Drama Studio at 7.30pm until Saturday 15 September. Tickets, priced at £9 full price and £7.50 for concessions, are available from www.eventbrite.co.uk/e/goodnight-mrtom-by-david-wood-adapted-from-michelle-magorians-novel-tickets-47117603019. Hallam ‘89 Theatre Club are a small amateur dramatic society based in Sheffield with a membership spanning all ages from early teens to pensioners. They stage two productions a year at Sheffield University Drama Studio as well as other occasional one-off performances and play-readings. For further information visit www.facebook.com/pg/Hallam89.